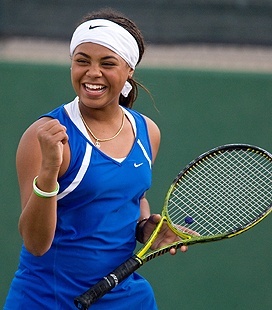 The USTA recently announced that Taylor Townsend (Stockbridge, Ga.), the No. 1 junior girl in the world, will compete among many of the world’s top junior tennis players in the 66th Orange Bowl International Tennis Championships, beginning Monday, December 3, at the Frank Veltri Tennis Center in Plantation, Fla. Townsend was awarded a wild card entry. The Orange Bowl, the longest-running and largest junior tennis tournament in the world, will be held on clay, the surface on which it was played from 1947 to 1998, for the second straight year. 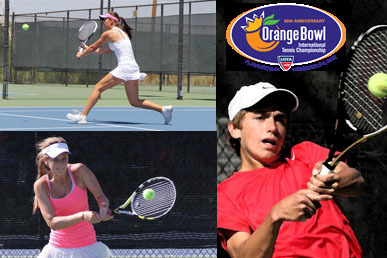 The Orange Bowl features singles and doubles competition for boys and girls in 18-and-under and 16-and-under divisions. Eleven of the world’s Top 20 girls and four of the world’s Top 20 boys are on this year’s 18-and-under acceptance lists. "The Orange Bowl is one of the world's marquee junior tournaments, and we're once again excited to see many of the best junior tennis players in the world compete against one another right here in the United States," said tournament director Lew Brewer, the USTA Player Development Director, Junior Competition. Southwest juniors Camila Fuentes (El Paso, Texas), Alexandra Letzt (Scottsdale, Ariz.), Maddie Pothoff (Tucson, Ariz.) and Nathan Ponwith (Scottsdale, Ariz.) are among those entered into this prestigious international tournament. Fuentes, who’s currently ranked No. 181 in the International Tennis Federation (ITF) World junior rankings, is playing in the tournament based on the strength of her world junior rankings. She is playing in the main draw of the Girls’ 18s event. Letzt (pictured, right) has been among the top Southwest girls for the last four years, and has even been ranked in the Top 2 in the country in Girls 12s and has captured an age group national championship event. She competed in the Junior Orange Bowl in 2008 as well in the 12s division and this year will be a part of the Girls' 16s qualifying event. Pothoff, the Southwest’s top girls player in the 16s division, is playing in that division in Plantation. Pothoff had some success in Plantation earlier this year, winning a national doubles title at the USTA Girls’ 14s Clay Court in July with partner Sofia Kenin. Pothoff has been playing more and more ITF-level junior tournaments this fall and winter to garner some experience. Ponwith, the top junior in the Southwest in Boys’ 16s, is also making the trip to Miami. Ponwith is quite familiar with the Miami area, as he’s been going back and forth from Scottsdale to the city, training regularly with the USTA Player Development team. Headlining the girls’ 18s field is the 16-year old Townsend, who in 2012 won the Australian Open junior singles title, junior doubles titles at the Australian Open, Wimbledon and the U.S. Open and led the United States to the Junior Fed Cup championship. Also competing are No. 3 Katerina Siniakova of the Czech Republic, No. 6 Francoise Abanda of Canada, the 2012 Pan American champion and Wimbledon junior semifinalist, and No. 8 Elizaveta Kulichkova of Russia. The American contingent also includes 2011 Orange Bowl semifinalist Sachia Vickery (Hollywood, Fla.), 2012 International Spring Championship finalist Chalena Scholl (Pompano Beach, Fla.) and 2012 International Spring Championship winner Allie Kiick (Plantation, Fla.), the daughter of former Miami Dolphins running back Jim Kiick. The Boys’ 18s field is led by No. 3 Gianluigi Quinzi of Italy, a 2012 Wimbledon junior semifinalist, as well as Frederico Ferreira Silva of Portugal, a 2012 European Junior Championship finalist, and Japan’s Yoshihito Nishioka, a 2012 US Open junior semifinalist. Noah Rubin (Rockville Centre, N.Y.) leads the Americans in the Orange Bowl boys’ field, having won the title at the Pan American ITF Championships and competed on the U.S. Junior Davis Cup team in Spain this fall. Also included are Mackenzie McDonald (Berkeley, Calif.), the 2012 Easter Bowl champion and Australian Open junior semifinalist, and Spencer Papa (Edmond, Okla.), who has captured titles on clay in 2012 at the Banana Bowl in Brazil and Copa Milo in Chile. The qualifying draw begins on Friday, November 30. The Orange Bowl returned to clay in 2011 for the first time since 1998, when it moved from the clay courts at Flamingo Park in Miami Beach to the hard courts of its previous location at the Crandon Park Tennis Center in Key Biscayne. Founded by Eddie Herr in 1947, the Orange Bowl quickly became one of the premier international junior events in the world and an annual showcase for the global scope of the game. Players from more than 50 countries have competed in the tournament, and champions have emerged from 26 different nations. A number of Orange Bowl champions have used the occasion to announce plans to turn professional. Past winners of the Orange Bowl 18-and-under singles titles include: Chris Evert (1969, 1970), Bjorn Borg (1972), John McEnroe (1976), Ivan Lendl (1977), Gabriela Sabatini (1984), Mary Joe Fernandez (1986), Jim Courier (1987) and Anna Kournikova (1995). Roger Federer (1998), Elena Dementieva (1998), Andy Roddick (1999), Vera Zvonareva (2000, 2001), Marcos Baghdatis (2003) and Nicole Vaidisova (2003) all won the event on hard courts. For more information on the 2012 Orange Bowl, visit www.orangebowltennis.org. The USTA is the national governing body for the sport of tennis in the U.S. and the leader in promoting and developing the growth of tennis at every level -- from local communities to the highest level of the professional game. A not-for-profit organization with more than 770,000 members, it invests 100% of its proceeds in growing the game. It owns and operates the US Open, the highest attended annual sporting event in the world, and launched the Emirates Airline US Open Series linking 10 summer tournaments to the US Open. In addition, it owns approximately 90 Pro Circuit events throughout the U.S, and selects the teams for the Davis Cup, Fed Cup, Olympic and Paralympic Games. The USTA philanthropic entity, USTA Serves, provides grants and scholarships and helps underserved youth and people with disabilities. For more information on the USTA, log on to usta.com, "like" the official Facebook page facebook.com/usta or follow @usta on Twitter. Chalena SCHOLL, Pompano Beach, Fla.
Jennifer BRADY, Boca Raton, Fla.
Alicia BLACK, Boca Raton, Fla.
Katrine Isabel STEFFENSEN, Scarsdale, N.Y.
Rasheeda MCADOO, Boca Raton, Fla.
Denise STARR, Staten Island, N.Y.
Alexandra MOROZOVA, Sunny Isles, Fla.
Rianna VALDES, Boca Raton, Fla.
Alexandra BOURGUIGNON, Boynton Beach, Fla.
Noah RUBIN, Rockville Centre, N.Y.
Martin REDLICKI, Hawthorn Woods, Ill.
Michael MMOH, Temple Hills, Md. Nicolas JARRY, Key Biscayne, Fla.
Farzin Danny AMIRI, Union City, Calif.
Drew HALBAUER, Boca Raton, Fla.
Dylan NUNEZ, Boca Raton, Fla.
Nicholas C. CRYSTAL, Waccabuc, N.Y.
Christian LANGMO, Boca Raton, Fla.
Ellie HALBAUER, Boca Raton, Fla.
Madison BOURGUIGNON, Boynton Beach, Fla.
Johnnise RENAUD, North Miami, Fla.
Lauren PROCTOR, Tega Cay, S.C.
Jessica GOLOVIN, New York, N.Y.
Olivia SNEED, Prairie Village, Kan.
Michaela GORDON, Los Altos Hills, Calif.
Amber PARK, La Canada, Calif.
Sophie CHANG, Havre de Grace, Md. Dennis USPENSKY, Atlantic Beach, N.Y.
Tommy PAUL, Coconut Creek, Fla.
Francis TIAFOE, College Park, Md. Alex RYBAKOV, Coral Springs, Fla.
Jess JONES, Warner Robins, Ga.
Josh SILVERSTEIN, Great Neck, N.Y.
Eduardo NAVA, Woodland Hills, Calif.
Cameron KLINGER, San Jose, Calif.
Tate ALLWARDT, Boca Raton, Fla.
Alex KNIGHT, Miami Shores, Fla.
Alfredo PEREZ, Coral Gables, Fla.
Jake STEFANIK, Coral Springs, Fla.
*An additional 38 American girls and 55 American boys will compete in 16s qualifying.